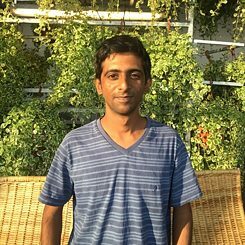 Nikhil Nagaraj is a sound designer and musician, who works primarily with theatre and dance productions. © David Simmons Using custom-made software instruments, he designs sound effects and contemporary electronic music. He also develops art projects based on live audio-visuals, interactive design and electro-acoustic sound research. Additionally, Nagaraj is the chief sound supervisor at a recording studio in Bangalore. He works collaboratively with audio-visual artists in a studio space too and invites the audience and composer to look at the music and to also break down the barriers that exist between the composer and the audience. 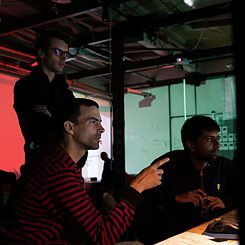 During his bangaloREsidency-Expanded@Wisp Kollektiv he plans to create a Manifold Interface Amplitude Panning spatialisation application that allows users to compose in three dimensions. © David Simmons Things started to get busy just a few days after I arrived in Leipzig with planning, traveling and setting up the .inf installation at the Ars Electronica Festival in Linz. 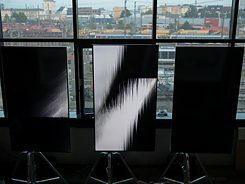 I had the job of building up the 4-channel sound system in which image and soundscapes, generated in real time, change continuously and remind visitors of the constant shifts in nature and social conditions, and of the never-ending movement of time. Each frame is unique and irreproducible. An algorithm calculates random behaviour patterns, while the sound responds automatically to changes in the image. The visual content was displayed on three 65-inch screens and exhibited for three days at the Festival. Wisp Laboratory was an intense week of © David Simmons setting up an immersive audio-visual system together with 30 participants in Kontor80, Leipzig. There I had the job of building the 32-channel 3D audio sound system and building the sound design on the system. The visuals were projected in 360° and both the audio and visual systems had bi-directional communication to manipulate parameters. The lab ended with the performance by Felix Deufel (Synthesizer, Percussion), Nikhil Nagaraj (Synthesizer, 3D Mix) Dorin Cucicov (Visuals) and Sebastien Branche (Spatialised Saxophone).